Ahh Valentine's Day. The overrated Hallmark Holiday. Also singles awareness day for my single friends. I am not a sappy need flowers and candy kinda girl. So to me Valentines day is just another day. In fact I told my husband I am glad he didn't get me anything. I just like spending time with my loves, him and my kiddo and my baby on the way. BUT. I still LOVE to bake and any excuse to bake is a good one. So I wanted to come up with my own version of something Valentine's themed, sort of a play on something. You see lots of chocolate dipped strawberries and since those are so good I figured hmmm why not try it in cupcake form. Since ya know I am allllll about the cupcake. 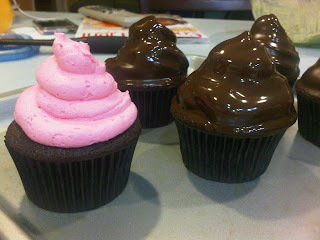 So I came up with a chocolate cupcake, strawberry italian meringue buttercream and then dipped them in chocolate like a Hi-Hat cupcake. SO GOOD! The chocolate cooled to a matte look instead of shiny which I thought looked pretty cool. 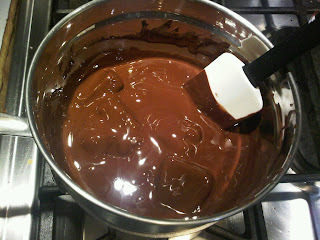 I chilled again to set the chocolate. Here is one cut in half ( duh). 1. Preheat the oven to 350°F (conventional) or 335°F (convection). Set the rack in the middle of the oven. For cupcakes, set racks in the upper-middle and lower-middle positions. Sift the flour directly into a bowl on a scale for accurate measuring. Measure the other dry ingredients into a separate mixing bowl, add the flour, and whisk for 10 seconds to blend. Set aside. Measure the liquid ingredients into a separate bowl and set aside. Measure the butter and sugar into separate bowls and set aside. Crack the eggs into a separate bowl and set aside. 3. In the bowl of a standing mixer fitted with the paddle attachment, cream together the butter and sugar on the lowest speed for 3 to 5 minutes. 4. With the mixer still on the lowest speed, add the eggs one at a time, fully incorporating after each addition. Stop the mixer and scrape the sides of the bowl. 5. Add the dry ingredient mixture alternately with the liquid mixture in 3 to 5 additions each, beginning and ending with the dry mixture. Move swiftly through this step to avoid overworking the batter. Don’t wait for the dry or liquid mixtures to be fully incorporated before adding the next. This step should take a total of about 60 seconds. 6. Stop the mixer and scrape the sides of the bowl all the way down. Don’t miss the clumps of ingredients hiding on the bottom of the bowl. Mix on medium speed for 15 to 20 seconds to develop the batter’s structure. 7. Prepare the pans. For 9-inch-round cakes, line the bottom of each pan with parchment; do not spray the sides. For cupcakes, lightly spray the pan with a nonstick spray to help release any overflowing crowns. Line the pan with paper liners. 8. For 9-inch-round cakes, deposit the batter in three separate areas of each pan and smooth out with the rubber spatula or an offset metal spatula, making sure the pans are two-thirds full. For cupcakes, use a 2-ounce, trigger-release, ice-cream scoop to deposit batter into the lined pans so they’re two-thirds full. 9. Follow the approximate bake times listed below. ITEM: 9-inch rounds - at Sea Level, bake 28 minutes; at High Altitude, bake 35 minutes. ITEM: cupcakes - at Sea Level, bake 22 minutes; at High Altitude, bake 20 minutes. 10. Once the top of the cake doesn’t jiggle in the center, test for doneness by inserting a bamboo skewer in the center of the cake. An even dark brown color should extend from the edge to the center, and the cake’s edges may pull away from the pan. When the skewer shows just a touch of crumbs or comes out clean, the cake is done. Remove the pan from the oven and place on a heat-resistant surface or wire rack. 12. For cupcakes, cool to room temperature, 25 to 30 minutes, before carefully lifting each cupcake from the pan. Proceed with frosting or store for later use. Yum! They look delicious and they are very pretty. I love these, my girls would flip for these!! I'd love to get the buttercream recipe too! THese are just incredible!!! I posted the recipe for you all! OMG!!! I have to make that recipe soon. Must taste like LOVE eating them. Wow.. these look delicious. I love chocolate covered strawberries. I have to try these. the strawberry icing looks so good!!! :) I also make mr browns IMBC. It is the best one I have tried I love it! for the strawberry puree do i have to cook it down or can i just run it through my blender? 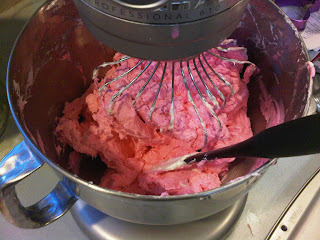 also do you add the puree after you make the buttercream or do you replace some of the water in the recipe with the puree?? if you add it after you make the buttercream it doesn't make it too soft or runny?? This is lovely! So this is how it is made! I really have no clue!